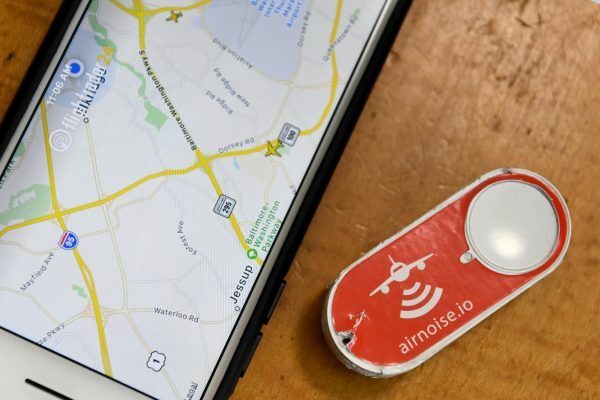 Push a hacked Amazon Dash button if you’re plagued by airplane noise @Airnoise_SAN #CitizenScience #NoisePollution « Adafruit Industries – Makers, hackers, artists, designers and engineers! Via WaPo Lori Aratani, Barbara Deckert has a new weapon in the war against airplane noise — and she’s not afraid to use it. That’s because with one click, Deckert has done what could have taken her hours to do a few months ago — she has filed a noise complaint with officials at the Maryland Aviation Administration. Airnoise is the brainchild of Chris McCann, who repurposed the same plastic Dash Button that Amazon customers use to order toilet paper and detergent. One click of the red-and-white button and McCann’s software program sends a detailed complaint directly to the agency in charge. So far, McCann has sent out more than 700 of the clickers. As 0f mid-December, users had filed nearly 1.1 million noise complaints at 29 U.S. airports. Users sign up via the Airnoise website. With a free account, users can file up to 15 complaints a month; for $5 a month, they can file unlimited complaints. The button costs $24. McCann, who has a full-time day job, says he charges just enough to cover his costs.